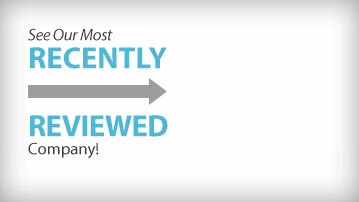 Each of our reviews, scores, and rankings are derived from our proprietary Ranking Criteria™. We do not have any relationships with companies that guarantee position, rank, or score…and we never will. Like many sites, we are compensated through affiliate relationships with each company we review; however, our Ranking Criteria™, along with real consumer reviews from people like you, ensure we remain honest and unbiased. Consumer Reviews: 30% of Overall Score. These 3 metrics not only help us understand what consumers are saying, they also help us gain an understanding of volume and recency. All of which are critical to understanding the value of a company in the eyes of the consumer. Note: this is different from the user score that is displayed on each company profile. The “user score” that is publicly displayed is the average of all user scores published for a given profile. In order to prevent fake and misleading user reviews, BHSC has a review moderation team specifically assigned to moderating all user reviews for all companies listed on the site. This team follows a very specific and strict moderation process that has been designed by gathering learning’s from mistakes other major review sites have made in the past. Installing a system is only half of the battle when it comes to protecting your home. Making sure your home and family remain safe through monitoring services is critical to the overall protection. How transparent is the company? Do they fully communicate ALL details of the product/service up front to the consumer? Or is the company secretive regarding pricing, terms, or other sensitive information? Are they willing to provide the consumer with all of the details regarding their product/service without the consumer needing to give up personal information? Does the consumer have to go through a consultation or fill out a form to get information that should be readily available on their website? Do you have recommendations for making the current ranking criteria of this site better? Are there parts of the ranking criteria that you disagree with and have an explanation as to why? We want to hear from you! Visit our Recommendation Form page and send us your feedback today!